The JDeveloper auditing framework can be a very valuable tool in delivering high quality code. It not only gives you warnings and errors during development, but can also be run from the command-line on a build server. One thing that always annoyed me is the limited possibilities for suppressing individual warnings. Sure, there is the @SuppressWarnings annotation for Java code. 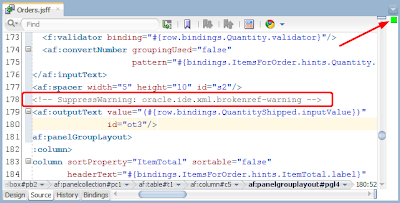 JDeveloper 12c can even use this annotation to suppress any warning, not only the ones supported by the java compiler. However, much of an ADF (or SOA) application is XML files, not java. 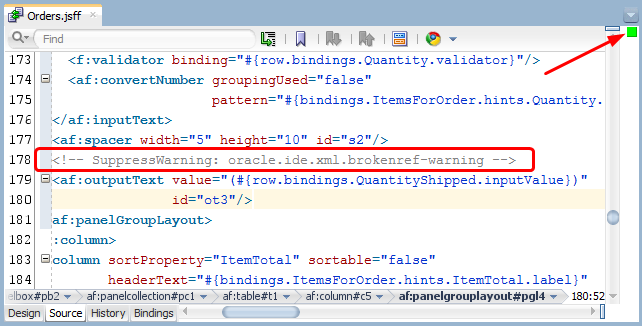 JDeveloper 12c doesn't offer a way to suppress warnings in these files. Luckily the auditing framework is highly pluggable and after some inspection how the @SuppressWarning annotation is implemented in the auditing framework, I could create something similar for XML files. The screenshot above shows how the extension works. 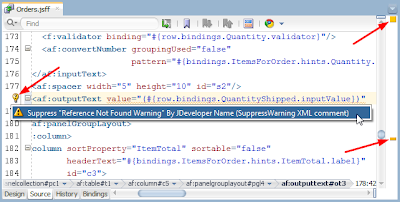 See the warning for the value property of the af:outputText component and how it marks this entire document as warning. Simply click the balloon in the gutter of the editor and select to suppress this warning. 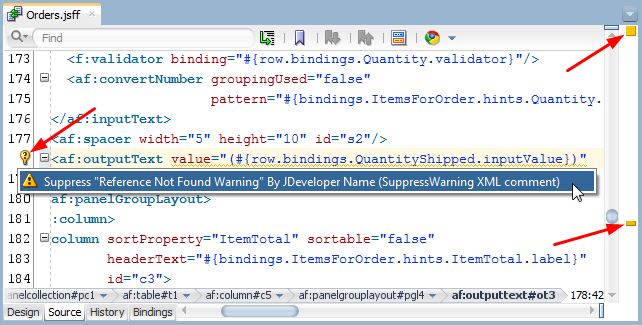 This adds a comment to the XML file to suppress the warning, very similar to a @SuppressWarnings annotation in java. Notice how the document is now marked green an no more warnings appear. With this extension you can keep the number of warnings down so the real warnings get the attention they need. I have plans on building a SonarQube extension to run ojaudit (the command line JDeveloper auditing tool) to keep track of your quality. Suppressing warnings can be especially valuable in that situation where you can use SonarQube to keep metrics and track unexpected warnings and errors. The extension is already live, so simply start JDeveloper 12c and use the Help > Check for Updates feature. Be sure to check "Open Source and Partner Extensions". You should be able to find the "Suppress Audit Warnings" extension. Please leave a comment below if you have any questions or suggestions for a future version. If you want to see how a custom suppression scheme is built you can download the full workspace or simply browse the subversion repository to look at the source code.